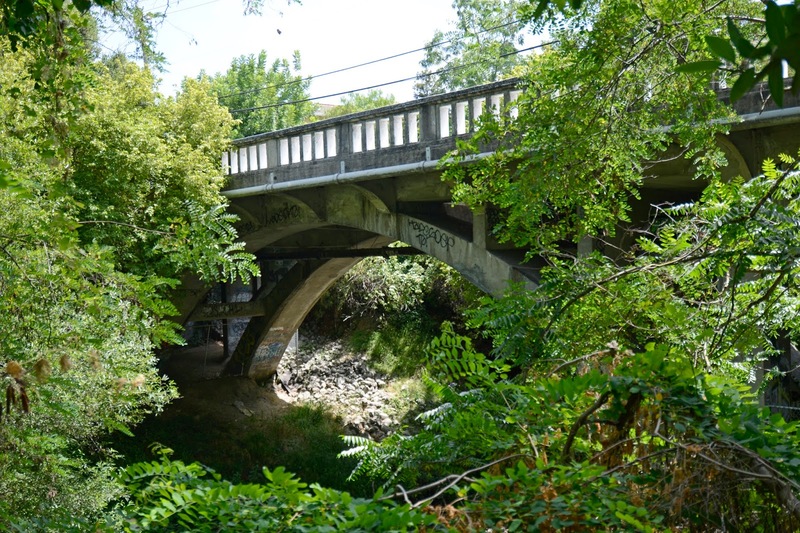 Just east of yesterday's Grove Way Bridge is the Center Street Bridge (33C0160) across San Lorenzo Creek. Although this bridge is older than Grove Street, it's not as unique, which may explain why it isn't registered as a historic place. There is no record of who designed it. It's just another open spandrel arch concrete bridge supporting a T girder superstructure. The Center Street Bridge does have a nice balustrade railing that was recently painted. The bridge was built in 1913, and it's 120 ft long, but only 24 ft wide. It includes sidewalks on both sides and an asphalt covered deck, which increased its weight and maybe produced the cracks in the pavement. Alameda County, California Bridges: Center Street Bridge across San Lorenzo Creek by Mark Yashinsky is licensed under a Creative Commons Attribution-NonCommercial-NoDerivatives 4.0 International License.